TeamDNR has announced the launch of a (very short) half-price sale for its channel-strip plug-in MixControl and also announced the release of Symmetry, a new soundset for u-he's ACE (Any Cable Everywhere). 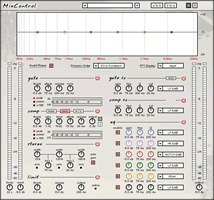 MixControl is TeamDNR's channel strip plug-in for Mac OS X (AU, VST, VST3) and Windows (VST, VST3, x64). 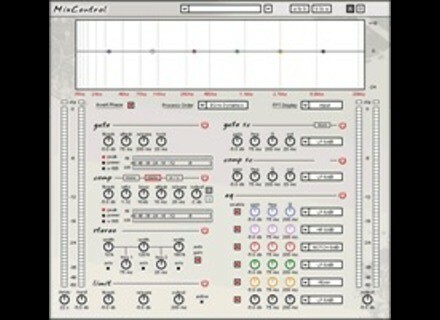 Until Monday, December 7th, 2009, MixControl will be available for $39.50. Symmetry is a set of 32 custom bass, atmospheric, sequence and plucked sounds meant to serve as a source of high quality, flexible patches for various musical styles. You'll find a combination of performance modulation included, as well as details about each preset included in the patch browser. Equinox Sounds Club Grooves: Urban Guitars Equinox Sounds has released 'Club Grooves: Urban Guitars', a downloadable collection from its content partner, Smash Up The Studio.